Michael Tyler and William Tiger didn't know one another before the summer of 2016. But they now share a unique life event. 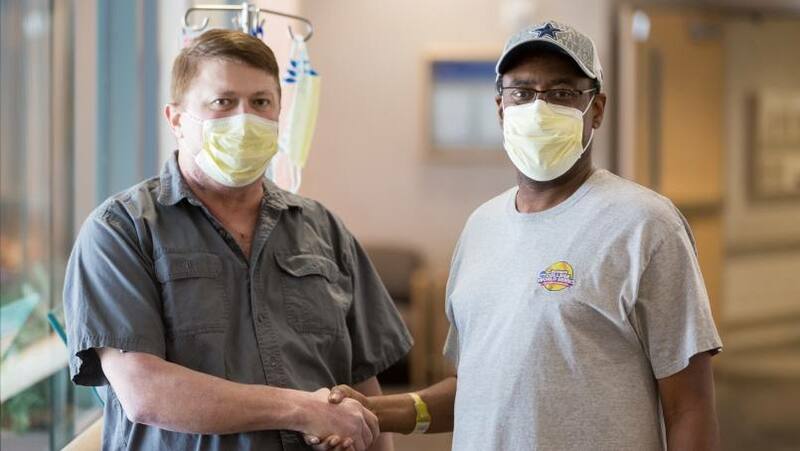 Both 55-year-olds underwent heart transplant surgery at Mayo Clinic's Arizona campus on the same day, at the same time. Completing the simultaneous procedures was a milestone for the Transplant Center team in Arizona, who had not previously been called on to perform more than one heart transplant at a time. "It was truly remarkable how the team came together," says transplant coordinator Allison Smith, who said the offers for both hearts came in on a Friday afternoon. Extensive coordination and precise timing were crucial to providing the best possible outcomes for the patients. "When we all came in on Monday morning and knew the patients were doing well, it was like a euphoric high," she says. Before their transplants, Michael and William both required ventricular assist devices, or VADs, to keep their hearts pumping until donor hearts were available for transplant. In William's case, he had dealt with heart issues for years. Motivated to be considered for a transplant, he lost 90 pounds to qualify for the surgery. When he found out a healthy new heart was available, William had been living with a VAD for seven years. He was more than ready to go through with the procedure and get on to the next chapter of his life — as was his wife, Liane, who had been his support and caregiver throughout the journey. Michael had his VAD implanted in January 2016. At the time, due to poor health, it seemed unlikely that he would be able to get a transplant. It was a profound disappointment for him and MiAnna, his wife. However, soon after, a call from Mayo Clinic surprised and delighted them when they were told that Michael's condition had improved enough to make him eligible to be placed on the waiting list for a heart transplant. The couple prepared for the possibility of a long wait. But they were stunned when, less than 24 hours later, a member of Michael's care team called to advise them to come to the hospital. A heart was available. They still marvel at the timing that enabled Michael to get the heart he greatly needed. When William and Michael were prepped in nearby rooms for their simultaneous surgeries, they were not aware that the timing of their transplants was noteworthy. They met only after they were healing well and their care teams told them about the landmark occasion. Completing two heart transplants simultaneously can significantly stress the available resources required to provide the gift of life for two patients in need. Two separate teams were needed to procure the donor hearts, and two separate teams of surgeons and physician assistants were required for the transplant surgeries. When the all-hands-on-deck signal came, though, it was received in a seamless fashion by the team. Octavio Pajaro, M.D., Ph.D., led one surgery, while Louis Lanza, M.D. led the second. "What an honor to be a member of this fabulous team," Dr. Pajaro says. Mike Marranca, a physician assistant in Cardiovascular and Thoracic Surgery, was thinking about a weekend off when the call came asking for help. He arrived at the hospital at 5 a.m. on Saturday morning. "It was a true spirit of teamwork, with everyone making sure all was covered. There was no grumbling," Marranca says. "It was a privilege being part of all that." Today, both William and Michael are at home, healing and working toward reclaiming their lives. MiAnna and Liane, who early on figured out that they had husbands who both received transplants on the same night, are keeping in touch to support each other.